Two Bears Farm and the Three Cubs: Finally! Hay! We were so late in getting up hay this year. We didn't get it up until the end of July. Mostly because we had lots of storms on a daily basis this summer. The weekend we got up the hay had temps in the upper 90s so it was rough work. Here is our hayfield on day two of getting up hay (we were over halfway done at this point). Our little hay barn isn't big enough for all the hay we get, so we try to have people come buy it directly from the field as much as possible. Bo, being smart for a second, and getting in the shade after running like a wild dog all over the pastures. I'm always glad to see the hay in the barn and the field nice and neat, and to know we won't have to do it again until next summer! Small bales have become a thing of the past around here. We've had so much rain I wonder if you'll get a second cut? Lucky you got it put up when you did, seems like it rained a lot since then. Nothing like the smell of fresh hay. Happy horses this winter. I passed two semis loaded with bales yesterday.the state fair just started so there will be some call for it there. Ah---RAIN... Wish we could get some here. We have had the driest summer I can remember--especially July and August (so far)... We are having to water the yard every single day now just to keep things ALIVE.... Sad---how some areas get so much rain and others, none. Looks like you have quite a large bit of hay. Not being a farmer (for any part of my life), I think the only time I ever bought hay was for an outdoor Halloween Decoration.... Ha. Oh wow....we could have done with some of that hay here! Our fields are not big enough to graze our cows and sheep and to also so we have to buy it in! Pictures of hay in the fields are always so pretty, and hark back to more innocent times past. I love the picture of Bo under the hay! How long does it usually take? I love seeing the small rectangle bales! That's what my dad did. Now so many around here are the big rolls of hay, which are pretty in their own way. I remember my dad "getting up hay." My brothers would help and neighbor teens. It's been so rainy in Omaha! Several houses were without power last night. I bet the hay smells wonderful, but that looks like a lot of work for sure. Nice!!! Gratz on getting it in. I have needed to doa second cutting for almost a month now on the front field and can never get enough days without rain to even do it. You sure have a great place. 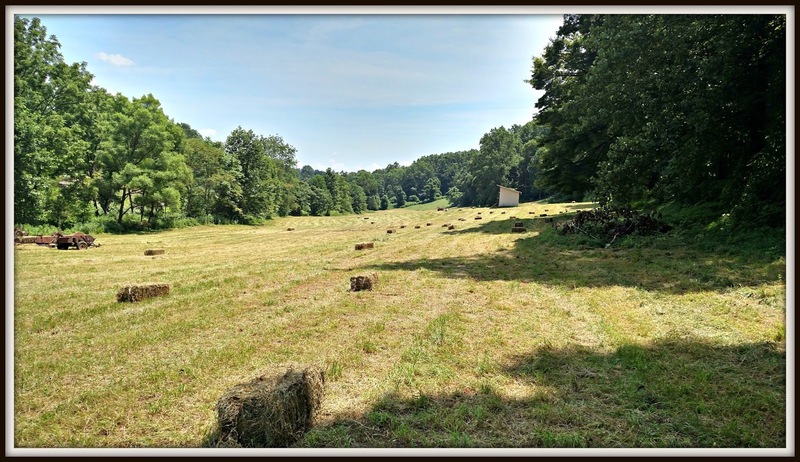 Everything a person could want, including your own hay field. When I build the winter dog bunker each year, I take the truck and buy about 15 bales. I have to pay Home Depot up to $7.50 a bale. In 1989, there was a terrible drought here and the hay did not grow. The people with cattle and horses were really worried, because they didn't see how they were going to get through the winter. But farmers and ranchers from out West sent 18 wheeler loads of hay to them for free. People here, the older ones, anyway, still remember that with gratitude. Glad you got it done! It is a lot of work! I used to make a dollar a day when I was in grade school just pitching hay up onto a hay wagon. 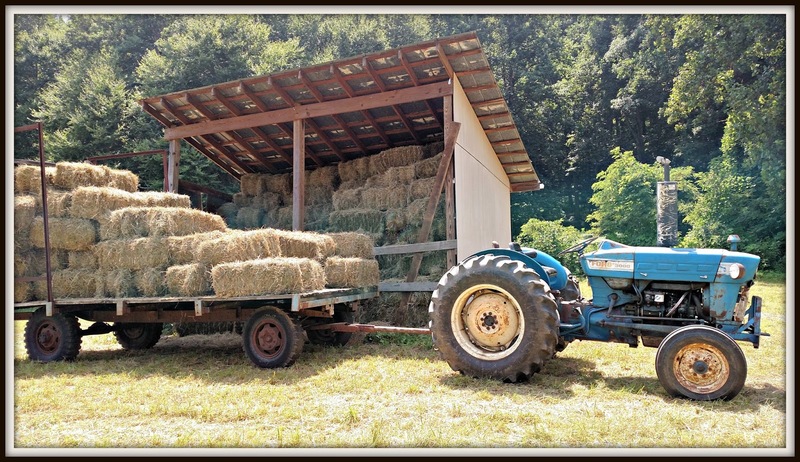 Then one year they brought it a hay baler and we got a dollar a day to lift the heavy bales up onto the hay wagon. They told us to remember that the bales only weighed 85 pounds, but it felt like they weighed a hundred to me. Around here they usually got a second cutting of alfalfa. This year, 2016, has been dry for the most part since the first of July. We got no rain to speak of. But today, we are getting a steady rain and I know everything alive is jumping for joy--a drink of water is what was badly needed and we are getting it. it is indeed a dirty prickly heavy job - congrats on getting it done. In the heat! Bleh. 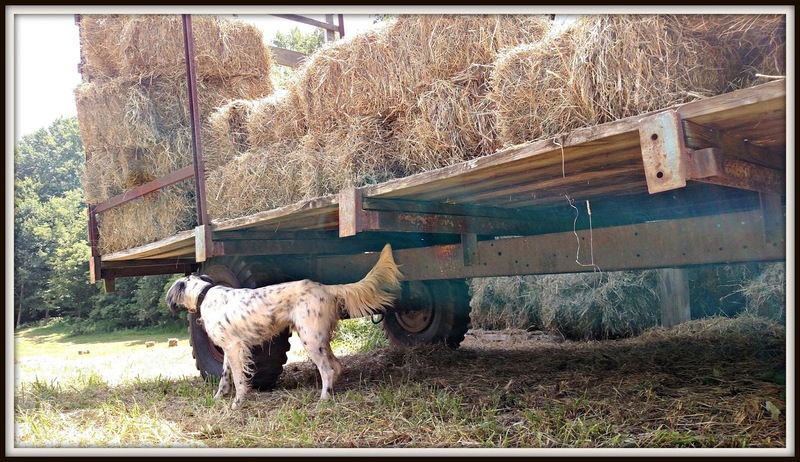 I love to see hay getting ready to go to the barn!